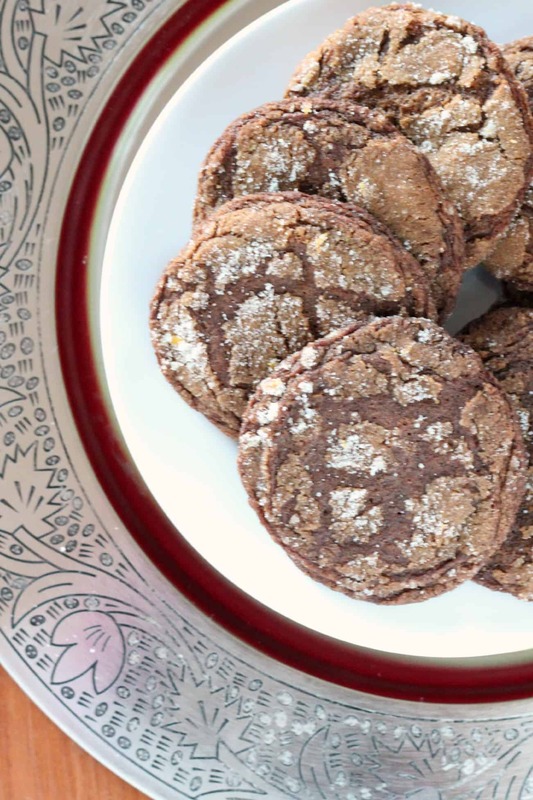 Molasses Ginger cookies are a lovely holiday cookie. 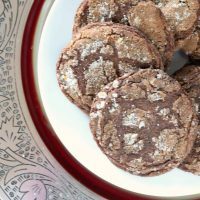 The spices in molasses ginger cookies are a blend of Christmas favorites– cinnamon, ginger, allspice and cloves– and with the addition of orange zest this cookie is a good choice for cookie exchanges, holiday gifts, and cookie platters. Holiday baking is all about coming together in your kitchen and sharing the foods you love. 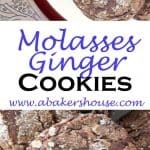 Whether you are following an old family recipe that has been passed through the generations or if you need a new inspiration like this Whole Foods recipe for Molasses Ginger Cookies, you’ll create plenty of smiles when you bake and share cookies. My son helped me roll the dough into little balls. He made his batch without the extra dusting of sugar and orange zest and the results were equally as nice. Do yourself a favor and take these cookies out of the oven while they are still soft so that they remain chewy. Let them rest on the baking tray for 5 minutes then move to a rack to cool completely. They will retain that softness for a few days if you place the cooled cookies in an airtight container. If you happen to bake them past this point, don’t worry, just call them gingersnaps and no one will mind. How nice that you can’t go wrong either way! Baking with molasses is great for more than just cookies. This Molasses Multi Seed Bread recipe makes a beautiful homemade loaf of bread. A recipe for hermit bars creates a molasses brownie texture that is addicting! Try to eat just one. Combine remaining 1/3 cup granulated sugar and orange zest in a shallow bowl. To form each cookie, roll about 2 tablespoons of the dough into a 1 1/2-inch ball, then roll in sugar mixture and transfer to ungreased baking sheets, spacing cookies about 2 inches apart. Bake until outer edges begin to set and centers are soft and puffy, 10 to 12 minutes. Cool for 5 minutes, then transfer to cooling racks and set aside to let cool completely. Whole Foods has a list of their Top Ten Baking Tips to help us all make beautiful cakes, cookies and pies this holiday season. Check our their valuable advice here to see how you can improve your odds of baking success at home. Whole Foods is offering one reader a $25 Gift card to get you ready for the holidays. Please enter below for your chance to win. The giveaway has ended. Please note that I participate in the Whole Foods Ambassador Program. The food for this post was provided to me at no charge and all opinions are my own. I have a recipe that I’ve used for years and while it seems such a fall cookie because of the spices I always make them for Christmas. I might have to add orange zest; that sounds good Holly. Yum!! I love orange zest in cookies. my best advice is to go to the store with a list, and do not shop at peak times when the store will be the most crowded! Sounds great Holly! Hope you had a very happy Thanksgiving! My best holiday advice would be to make sure that your guests don’t have dietary restrictions. I am so sorry it has taken me this long to get over to visit your site. It has been insane the last few weeks but now I’m free till Jan so I’m enjoying it! 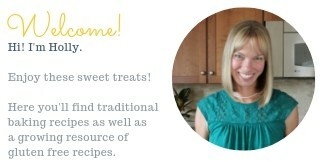 Finally getting a chance to visit all my blog friends and read about their goodies. I hope you’ve been well, we need to get together again, maybe after the New Year. Love these cookies! I have to confess, I’m enjoying not having to churn out 6 dozen cookies every week or more….I’ll enjoy the break I think ?